Lordy, Lordy, Yankee Texan Mom is turning 40! I've partnered with some fabulous bloggers to celebrate. We've come together to give y'all the presents! Each blogger has donated a giveaway and we will be giving away nearly $1000 in prizes!!!!!!!!! The giveaways will begin on August 28th, The day that Mr. Yankee Texan Mom turns 40 and will conclude on her 40th birthday, October 7th. A giveaway a day for 40 days!! Prizes include Amazon Gift Cards, Restaurant. com Giftcards, jewelry, Paypal Cash, Coupons, beauty products, books, health and wellness items, a booster seat, a camera and more! 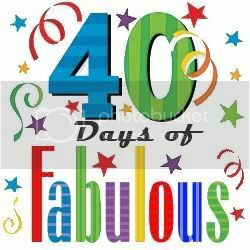 There is something for everyone in these 40 days! You will have a ton of opportunities to enter. There will be one Mandatory Entry with the remainder being optional. In order to win the prize from a particular blog, you must complete the entries for that blog. So, if you'd like to be entered to win all of the items, you will need to complete all of the entries. As a bonus, each entry throughout the month enters you to win the grand prize from Yankee Texan Mom. Winners will be announced throughout the month via email and will be verified. Enter on couponingwithmartha on Facebook!! GoodLuck! !